We still believe this, but electorates in the Western World responded by voting to close borders and build walls to keep foreigners out. A violent rhetoric of hatred and fear is being constructed around people who's only 'crime' is to be born in a foreign country. We want to refocus the debate around immigration to what lies at its heart: people. We wish a happy and healthy new year to you all! For poster for tomorrow, 2018 is going to be a year of change. We will make further announcements soon, but for the most important thing to say for now is that we will announce our topic for this year's contest on the 20th of January. Speak to you soon! Our book is released! Names are out and the gallery is open! Today is the day. 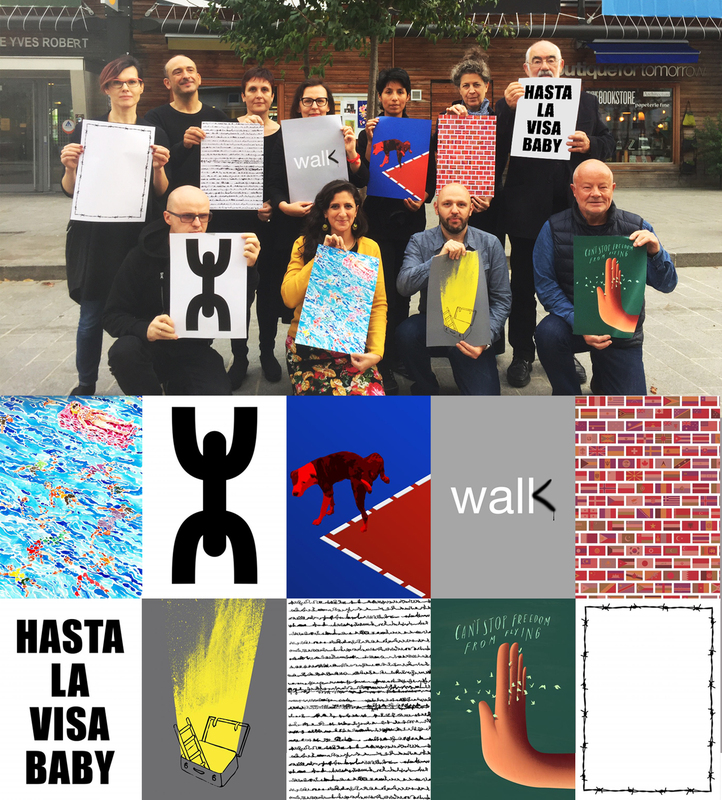 We are excited to publish, for the world to know, the names of all the designers that took part, with their work and their passion, to the 2017, Freedom of Movement edition of poster for tomorrow. They're more than a thousand and it is only thanks to them that this edition has been such a success so far. We'd like to express our gratitude to all of you, men and women from the whole world, involved in this movement. Our Online Jury memebers, Live juros all particpants. Freedom of movement Live jury soon! As you all know the online jury team has finished their work on September 15th. Once again, we'd like to thank the 50 women and 50 men who took part in the intimidating task of evaluating an amazing number of entries. On 10 October 2017, our jury members are meeting in Paris. As every year, they are going to point out the 100 best posters amongst 400 shortlisted. We will keep you posted as soon as possible. The online jury process is now open! From now to September 10th, during 50 days, our 100 jurors will review all the received entries. It’s a very tough and time consuming mission. Thanks to their work, as every year, we will have our 400 hundred shortlisted posters. We'd like to thank them all for their precious work, we are really grateful to them for their willingness to dedicate their time to our initiative. 6993 entries! Call for entries closed now! Freedom of Movement competition is now closed for entries. This 6 days of extension gave everyone enough time to get their posters in. During last 10 days, we have answered to more than 1000 emails. We're extremely happy that we helped hundreds of you with technical issues. From now to July 25th, we are going to prepare these posters to be judged by our online jury during 50 days. The online jury is formed of 50 men and 50 women from all over the world and is made up of graphic designers, charity workers, teachers and people from a variety of disciplines. We'd like to take this opportunity to thank everyone who entered the competition, all the teachers and professors who incorporated poster for tomorrow in your programs, all our supporters and friends! Deadline extended 6 more days! 6 more days for those of you having trouble uploading your artworks! To check if your entires have the perfect size. One pixel less, one pixel more, and you will get an error! 6 more days to give a chance to our asian friends who can’t access to the website; to give everyone enough time to get their posters in. The new deadline is Sunday the 16th of July, at midnight (11:59), Central European Time (CET). We are overwhelmed by the huge quantity of posters received by email. “Freedom of Movement“ Call for entries is open! We are pleased to announce that poster for tomorrow's 9th call for entries, “Freedom of Movement”, is now officially open. You have until Monday the 10th July to enter the contest and submit your poster entries through our website. The full brief, regulations and more tips are available for download in several languages here. We would like to thank Francesco Poroli for providing the fantastic artwork for this year’s edition. This is what he said immediately after reading our first topic announcement: it came to my mind that we usually say "free as a bird“ … If you’d like to see more of his work, please click here. Good luck – and get busy!